After seeing several reviews raving about the Revlon Colourstay foundation I knew I had to try it out for myself. Once in Boots, I matched myself to the perfect shade ‘medium beige’, payed at the till and then ran home to play with my goodies! 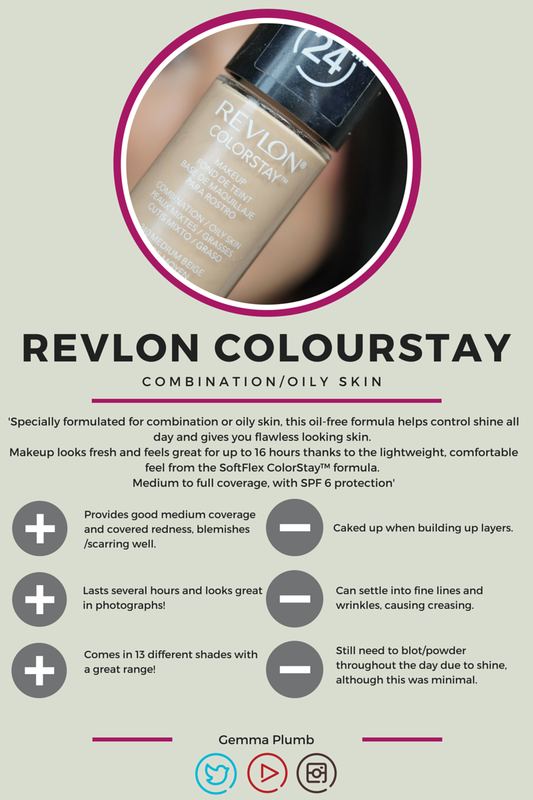 After hearing so many amazing things about this foundation, I had my expectations set high and Revlon did not disappoint! As someone with oily skin and a lot of redness, I love foundations with a good coverage, matte finish and but aren’t super drying on the skin. Unfortunately, my skin is very sensitive to the weather and since we’ve recently been experiencing a frosty spell, my skin has been dehydrated and in desperate need of moisture. So to put this foundation to the test, I moisturised my entire face as normal and primed one half of my face to compare how well it applies and lasts throughout the day! Personally I didn’t notice any significant difference in the application of the product. It went on so smooth and blended out beautifully! After one thin layer you get a medium coverage, which was perfect for covering up my dark circles, redness and blemishes. After applying another layer, you reach a full coverage. Personally, I felt it began to feel heavy on the skin and began sinking into my pores, making them quite obvious. When I tested the foundation out with flash photograph, I was really happy with the result. There was minimal flashback and it just leaves the skin looking even and flawless. I would definitely recommend this foundation for days you’re in front of the camera! It really looks beautiful. As for the longevity of the product, it definitely lasts the day well. After 5 and half hours it still looked incredible! However, at this point I did need to powder my T-zone as this was beginning to look quite shiny. But other than that I’m so happy with how well this foundation wears throughout the day! So, for my combination/oily girlies, I’d 100% recommend you try this product if you like something that won’t budge through the day and looks amazing in pictures. A perfect product for a night out dancing! If you want to check out my first impression as it happened, feel free to check out my first impression video on youtube! Previous Post What I’m going to wear to Cheltenham Races Ladies Day on 11th March! I have dry/combination skin…should I still try this?